It feels good to enjoy the sunrise without the usual morning rush. We have a relatively easy day on our schedule and we already bit part of it off yesterday by hiking 3 miles past our destination. 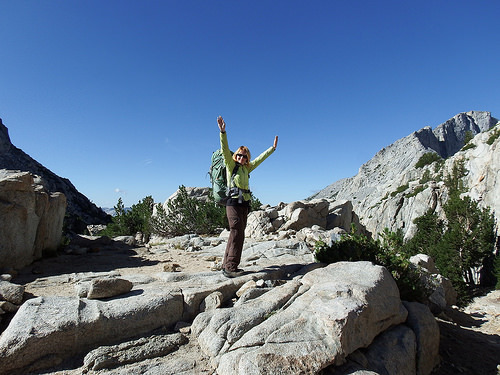 Our first goal for the day is to climb Selden Pass. The top is only a mile away on a well graded trail. 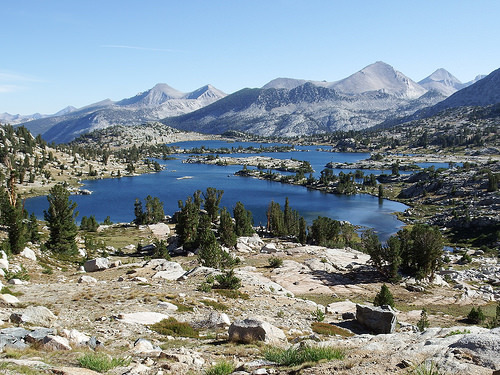 After soaking the incredible views, we have a long downhill which will take us to Muir Trail Ranch, the last place to resupply, unless you want to use expensive mule delivery. I have never carried 10 days worth of food on my back and I have to admit that I am not thrilled by the idea but to save $600.00 I am open to playing the role of the mule myself. Our strategy is to eat the heaviest items first and bring the weight of our pack back to reasonable poundage as soon as possible. I’m assuming things will get easier in 4 or 5 days. But for the next 8 miles or so I let the worry about weight skip my mind. The views are simply too gorgeous to cloud them in worries. Behind us Marie Lake reflects the blue tones of the sky, on the other side of the pass Heart Lake and Sallie Keyes Lakes compete for our admiration. Unlike at VVR we don’t receive a warm welcome at Muir Trail Ranch. 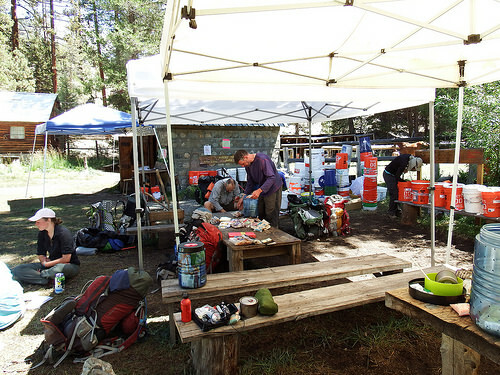 There is an area where we can sit and sort our resupply but no other services are offered. Can we use the bathroom? No. Can we get something cold to drink? No. Can we cook our lunch here? No. There is a very small store that carries souvenirs and fuel. The cashier’s face betrays no smile when we walk in and ask to buy a jetboil canister. He does not wish us a nice day when we walk out after spending nearly triple what it would cost to buy the same canister in regular store. They want us in and out quickly and they don’t hide it. And really after our food is packed and our electronics are charged, we do not have a reason to linger. We say goodbye to Kate and Ehsan. Their itinerary is slightly different than ours and it is unsure whether or not we will see them again. Emily is considering quitting the trail. Trying to keep up with much faster pace of her companions is wearing on her. Even if she decided to push through, we are not likely to see her again. The group did not plan properly and has to detour to Florence Lake to resupply which will put them couple days behind us. Saying goodbye is never easy but it is a frequent part of the trail life. We wish everybody well and continue own own journey. My pack is at 42 lb, Dave’s weights 45. Coming out of MTR is easier that we expected. The trail is downhill and it helps but even when we reach the bottom and start ascending again, I find plenty of energy to climb the hill and so does Dave and feeling good we pass the site we thought to camp at tonight and continue two more miles to a nicer spot by Piute Creek where we find Sarah and Michelle and several other hikers already settled in. We join them for a dip in the creek, and a dinner… and new trail friendship starts to form. 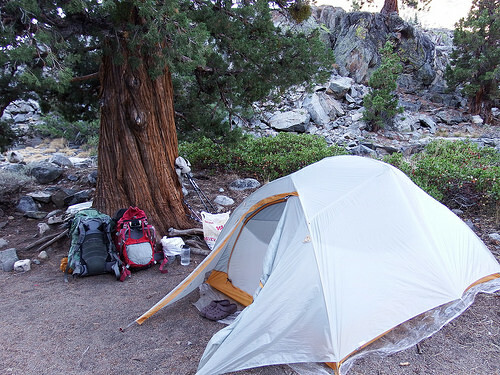 Flat campsite under a beautiful tree. The simple things that make backpackers happy. Tomorrow we’ll dare to try wild currants and I will nearly step on a snake.